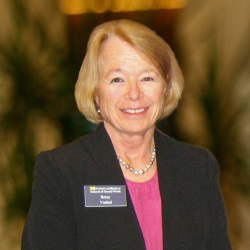 Betsy Voshel retired in January 2017 after a long and distinguished career which includes 22 years at the Department of Veterans Affairs (VA) Medical Center in Battle Creek, MI, 4 years leading Field Education at Western Michigan University, and 13 years leading the University of Michigan School of Social Work (U-M SSW) Office of Field Instruction (OFI). Betsy recently reflected on her career and her contributions to this school. “Assessing and improving systems.” That’s Betsy’s shortest description of her work. All throughout her career, she has embraced opportunities to improve and expand processes and services. At the VA she learned to “do it first, then figure out how.” This approach enabled her to create valuable programming for many veterans and win a national award for her intensive outpatient program. Improving systems has included modernizing processes in each workplace, from retiring Rolodexes to moving forms and training materials online. “Wraparound service.” That’s what many agencies strive to provide for clients, and that’s what Betsy believes OFI now provides to students. She notes the central place of field in every MSW student’s education, and describes a “three-legged stool” consisting of the student, the agency, and the university, with the field faculty at the center of that stool. Under Betsy’s leadership, OFI reorganized so that the field faculty member who places a student also oversees the placement as a liaison and teaches the field seminar, giving the student one consistent point of contact and support. Ethics form the lens through which Betsy views her work, both her interactions with students and colleagues and the practice of social work. The NASW Code of Ethics forms a key piece of MSW field orientation and of ongoing training and seminars. Stacy Peterson says that Betsy “strengthened the ethical lens” of OFI. Reaching a wider audience, Betsy has presented and published on specific ethical issues, most recently on the use of social media by social workers. Betsy appreciates all the strong support she has received from the Dean and from administrators, IT professionals, and others. Support from the Dean’s Office allowed OFI to hire more field faculty members. The Dean’s support also provided computers, cars, and funding for international field placements (which are developed in collaboration with our Office of Global Activities). Betsy credits Professor Mary Ruffolo with collaborating on field-focused grants related to developing workforce sustainability, and with “creative innovation” like offering free CEU’s to active field instructors. Betsy values teamwork and collaboration very highly. The opportunity to work with a team was part of what brought her to U-M SSW. She seeks connections within the community and professional organizations, and has held offices in both NASW and CSWE. She credits U-M with “letting me spread my wings” in terms of scholarship and professional service at state and national levels. Betsy regrets that she will not be here to work with the new SSW leadership, especially Dean Videka, who she describes as a “field-friendly, dynamic, incredible leader.” But she knows it is time to move on. She says “fifty years of earning a paycheck is enough.” (She started work as a young teen.) She feels good that she is leaving a strong, well-functioning team to continue serving students and field instructors alike. So how will she start the next chapter of her life? She looks forward to enjoying “freedom from the calendar,” doing what she wants, when she wants, how she wants. Her immediate plans include taking a road trip to South Carolina to visit her former mentor who was Chief of Social Work in the VA. She also looks forward to spending quality time at the lake with her husband Geoff, her Australian Shepherd Jozie, her daughter’s family (which includes a new granddaughter Eloise), and her son and his wife.